June 27 to July 2 — I’m slated to be in Belém (at the mouth of the Amazon River) for the Reformed Conference hosted by Word of Truth Reformed Association and the Puritan Project. I will be speaking on the doctrine of the church as found in the Belgic Confession. More details about the conference can be found here (in Portuguese). July 2 to July 6 — I plan to go south to Maragogi (just south of Recife). There the Puritan Project is hosting another edition of the same conference. I will be speaking on the same topics there as in Belém. At this conference, there will be quite a few members of the Reformed Churches of Brazil. I should also mention that at both conferences I will be speaking with Dr. Nick Willborn. July 7 — I’ll be in Recife at the Aldeia Training Center. They’ll be hosting a Training Day and I’ll be speaking on Mormonism. July 9-11 — I’m scheduled to be teaching an evangelism course at the John Calvin Institute, the seminary of the Reformed Churches of Brazil. Besides the above, I’ll also be preaching at various churches and probably some other stuff that will pop up along the way. I’m not sure what my Internet access will be like while I’m down there, but as circumstances allow I’ll try to post some updates here. Tomorrow it begins with a flight to Miami. I’ll meet Dr. Willborn there and then together we travel to Belém (via Manaus) on Wednesday. Should be exciting! “The Reformed Church is Alive in Ukraine,” was the title of an article by J. Van Rietschoten in the July 9, 1999 issue of Clarion. In that article from long ago, we learned of the mission work being doing in Ukraine by our Dutch sister churches. Van Rietschoten told of how the Reformed church at Hattem had sent out two missionaries, Rev. Marten Nap and Rev. Jan Werkman. They were working to assist the fledgling Evangelical Reformed Church of Ukraine. Now flash ahead to today. I recently had an opportunity to visit Ukraine and see some of the mission work first hand. Rev. Nap and Rev. Werkman have repatriated, but others are carrying on the work. How is the Reformed faith progressing in the largest country in Europe? What kind of fruit has come from over a decade of work by the Dutch missionaries? I was greeted at the Boryspil airport in Kiev by Rev. Jos Colijn. He was mentioned in Van Rietschoten’s earlier article, but at that time was working in Hungary. Since then he has moved to Kiev where he teaches church history and dogmatics at the Evangelical Reformed Seminary. This institution provides theological training via a modular program. The staff comes primarily from our Dutch sister churches as well as from the Presbyterian Church in America (who also have a number of missionaries working in Ukraine). The students come from the Evangelical Reformed churches, as well as from the Presbyterian churches. On the Lord’s Day, I worshipped with the Evangelical Reformed congregation in Kiev. There were about 40-50 people in attendance, mostly made up of young people and families. This church has its own modest building and pastor. Interestingly, the service was conducted in a mixture of Ukrainian and Russian – not uncommon in Kiev. After the service, the brothers and sisters spent time fellowshipping, just as they do in other parts of the world. Later that afternoon, I joined my Dutch colleague as he taught a catechism lesson at a house church in another part of the city. This church had been Pentecostal and was in the process of learning how to be Reformed. The pastor and elder of the church had invited Rev. Colijn to teach them the Heidelberg Catechism. In a room in a small apartment in a huge complex, there we sat with some ten people and Rev. Colijn taught the Reformed doctrine of the Lord’s Supper. There were some questions and discussion afterwards, but from all appearances his teaching was well-received. That weekend the other two Dutch missionaries (yes, there are now three!) were much further south in Ukraine. Rev. Henk Drost and Rev. 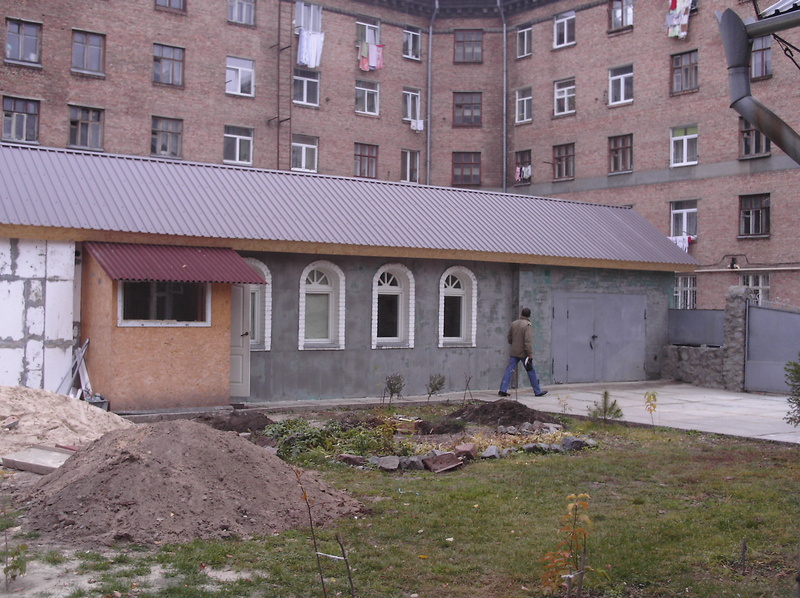 Cor Harryvan were assisting two of the Evangelical Reformed congregations near the Black Sea. They returned to Kiev on Monday along with a group of men who were going to attend the conference scheduled for Tuesday and Wednesday of that week. Rev. Henk Drost lives in the city of Rivne, about 350 km west of Kiev. 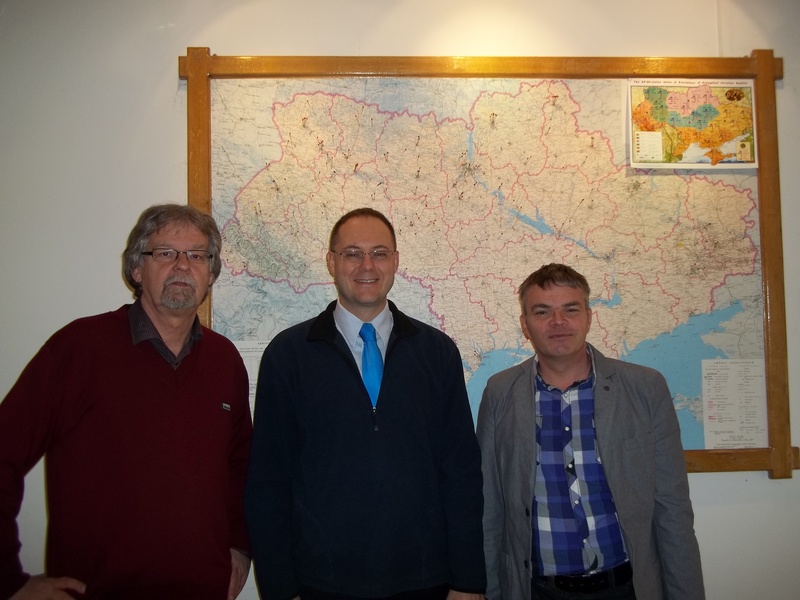 From there he provides mentoring throughout Ukraine for the Evangelical Reformed Churches. Rev. Cor Harryvan has the same task, but he is based in Kiev. The reason I was in Ukraine was to speak at the All Reformed Conference. This was held on Tuesday November 8 and Wednesday November 9. I spoke on the subject of my doctoral dissertation, the missionary significance of the Belgic Confession. The Conference was held at a Baptist retreat in a beautiful outlying area of Kiev. Attending the conference were Reformed and Presbyterian elders, pastors, and missionaries from all over Ukraine. There was also one brother who came from the neighbouring country to the north, Belarus. In terms of the time travelled to reach the Conference, some of these men had given up far more than I had. They spent many hours by train and bus to attend this time of learning and fellowship. They appeared to be quite interested in the subject and we had some excellent discussions. Of course, since I don’t know Russian or Ukrainian, all of that had to take place through a translator. Sergey Nakul was always at my side (or slightly behind me) giving me the gift either of tongues or of understanding – he did excellent work! All Reformed Conference. Pastors, elders, and missionaries attended from all over Ukraine and Belarus. From the conference it became apparent that the Reformed faith is holding its own in Ukraine. There is some modest growth, but there are also many challenges. Some of those are cultural and have to do with the fact that Ukraine is a post-communist nation. Communism fostered suspicion and a lack of trust that is still embedded in the psyche of Ukraine. Some of the challenges are spiritual and have to do either with the atheism birthed by communism or false teachings masquerading as Christianity. Other challenges are personal. Slavic peoples admire strong men who dominate even to the point of tyranny. In Reformed church leadership that approach rarely, if ever, ends well or really serves God’s people. Despite these challenges, the Reformed churches in Ukraine are committed to the truth of God’s Word and to the life-changing power of the gospel of Jesus Christ. They continue to reach out to this dark world and, in small measures, God is blessing their efforts. In the earlier article in Clarion, mention was made of the St. James Bible College. Some United Reformed pastors had been involved with teaching the Heidelberg Catechism at this institution in Kiev. Even though St. James was not Reformed, they had been invited and were welcomed to bring Reformed teaching. Before I left for Ukraine, and after I returned, several people asked me about this. I inquired about it while in Kiev. This institution apparently changed direction in the last decade and is now hostile to the Reformed faith. This is a sad turn of events, but the upside is that the Lord did bless the efforts of URC pastors such as Rev. Ray Sikkema. Some of the current students at the Evangelical Reformed Seminary first heard and embraced the gospel of grace via this means. These days there’s a lot of negative press about our Dutch sister churches. To be sure, there are some reasons for concern. But there in Ukraine I encountered some Dutch brothers who were deeply passionate about being confessionally Reformed and missional. My time there was delightful, not only because of the cross-cultural experience (mmm…borscht! ), but especially because I felt a real bond of fellowship with my Dutch colleagues. I could enjoy their fantastic hospitality and some thought-provoking discussions on theological and missionary matters. We can be thankful for the good work being doing by these men on behalf of our Dutch sister churches. May God continue to richly bless their efforts for the gospel of our Saviour. More information about the Dutch mission work in Ukraine can be found at the website of the Ukraine Committee (includes English content). This evening I leave for Kiev, Ukraine. I’ll be there for about a week. The purpose of the visit is to speak at a conference next week. The details of the conference are here in Russian and with a rough Google translation into English here. The theme has to do with the missionary significance of the Belgic Confession, a topic I’ve written a book about. I’ll try to make some blog posts while I’m there. When I get back, I’ll conclude the series on liturgical change in the CRC. Have you ever heard of it? The Principality of Outer Baldonia was a micro-nation just off the coast of Nova Scotia. It was renowned for having declared war on the former Soviet Union. The war apparently involved a lot of fishing on the part of the Outer Baldonians. It sounds like there’s something on the micronation at the Yarmouth County Museum. We’re definitely going to check it out the next time we’re out that way (the museum looks really good anyway!). If I ever get to Hawaii, I’m definitely going to try and do the Ha’iku Stairs on Oahu (assuming that it’s safe and legal when I visit, of course). Gadling recently did a feature on it. This video gives a good idea of what to expect.